The First Vendidad Sade and Baj in NA at a Dar-e-Meher Inauguration, and Enthronement of Dadgah in the ZANT Brand New Built From Scratch ZCNT (Zoroastrian Center of North Texas) April 29-30 2011! 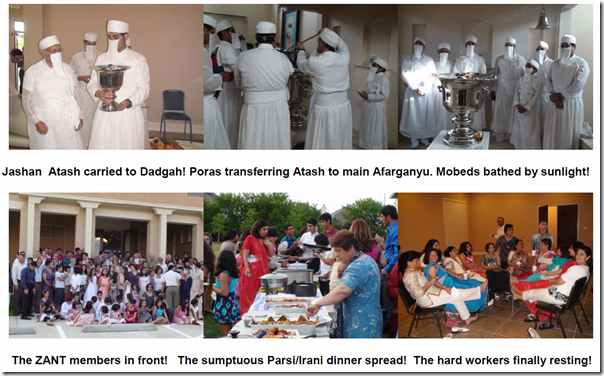 At the FEZANA AGM in Dallas in 2007, I first saw the dreams and plans of ZANT (Zoroastrian Association of North Texas) for building a brand new Dar-e-Meher in their Zoroastrian Center of North Texas (ZCNT) in Dallas. And I instantly made a pledge that I will be there to celebrate their Center’s opening! And with the grace of Ahura Mazda and with the blessings of Pak Iranshah, Jo Ann and I were so fortunate to attend this inauguration with the prayers of the Vendidad Sade and Baj performed the first time in a NA Dar-e-Meher inauguration! Over the years, I have been in contact with Firdosh Mehta and my good fellow Mobed friend Ervad Poras Balsara as regards their Dar-e-Meher installation, what prayers to perform, etc. We contacted Dasturji Feroze Kotwal, Ervad Dr. Ramiyar Karanjia, London ZTFE President Malcolm Deboo and my fellow Mobed Rustom Bhedwar of ZTFE, and others to learn from their experiences and to seek advice and guidance for these ceremonies! After a number of false starts, I received an email from Poras in Mumbai that the inauguration is finally set to be on April 28th Friday morning with the Vendidad Sade prayers starting after the mid-night, followed by a Baj next day in the morning and the inauguration Jashan and Dadgah installation in the afternoon. I had to change my plans to arrive in Sarasota on Tuesday 26th from Mumbai and to Dallas the next day! So, here we were at the center on Wednesday helping out with the next day prayers! The first ever Vendidad prayers were performed by Mobed Poras Balsara, Mobed Yazdi Dastur, grandson of late Vada Dasturji Ferozeji Dastoor of Udwada, both from Dallas and me. We started the prayers around 12:20 AM with the participation of about 35 local ZANT members and were very happy and relieved to complete all the 22 Fargarads of Vendidad by 6:10 AM! About 25 ZANT members were still there to see the completion. It was the first Vendidad Sade by me after some 60 years when I became Martab in Pak Iranshah! I prepared for this by going over the prayers in Udwada, as well as at over 30,000 ft. in the planes coming from Mumbai! A great way to be closer to Ahura Mazda! In the morning of Saturday April 30th, we started the Sarosh Baj prayers, performed by me. The first ever Baj ceremony may have been performed by my brother Mobed Palanji P. Dastoor, Panthaki of JD Colaba Agiary in Mumbai, in May 1986 in the home of Roshan and Pervaze Rabadi in Toronto at the occasion of Varadh Pattar for their son Neville’s wedding. Also, Mobed Gustad Panthaki has performed Baj ceremony in OZCF Dar-e-Meher during Muktad Days. However, this is the first time in NA that a Baj ceremony is performed for a new Dar-e-Meher inauguration! There were about 50 ZANT members to witness this ceremony. In the afternoon, at about 4:15 PM, under the leadership of Ervad Poras Balsara, the inauguration Jashan was performed with 6 other Mobeds: the youngest Ervad Burzin Balsara, son of Poras, Yazdi Dastur, Cyrus Dastur, Zubin Kotwal, Hormuzd Karkaria, and me. The Jashan was performed with 5 kardas. with many a wet eyes in the prayer hall! The outside weather was cloudy throughout the Jashan ceremony but just about the time when the Mobeds were able to set the fire ablaze, the sun burst through with its wonderful golden rays right on the fire which created a surreal atmosphere to be remembered by all present! Someone up above was showering HIS blessings to this new wonderful Dadgah! 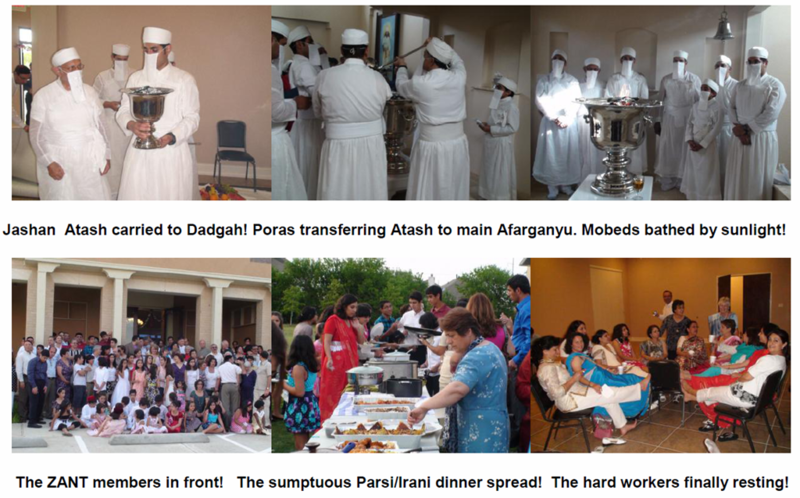 Almost 150 ZANT members attended the Jashan and the Dadgah Investiture as well as the dinner there after. In our 45 years together, Jo Ann and I have been very fortunate to have uplifting moments in our lives! However, our participation in this inauguration and my personal involvement in all the prayers will always be with us as one of our most uplifting moments in our lives! We want to thank Dadar Ahura Mazda for allowing us to witness this as well as the whole ZANT community who has adopted us both as one of their own and we bow our heads to all of them in humility and gratitude for allowing us to be one of them! We pray that this center will bring this wonderful community together as one, for ever in HIS service and prosper and achieve all that they want to for their wonderful community and the ZCNT! In the last Para of Atash Nyayesh, “Upa-thw? hakhshoit geush v?nthwa”, the fire blesses the devotee who brings an offering (sukhad, incense, etc.) to him. May these blessings of the ZANT Dadgah Fire be bestowed upon all ZANT families and all the FEZANA families so that we all help to spread the knowledge of our beautiful religion among all our fellow Zoroastrians and to all with whom we come in contact! Atha Jamyaat, Yatha Aafrinaami! (May it be so that I wish! ).